Snowmobile Trails in Winnebago County interconnect with surrounding counties. Use of the Winnebago County Snowmobile trails is permitted only when public notice has been made by the Winnebago County Parks Department. Snowmobilers making use of the trails without authorized opening may be fined or ticketed. The Winnebago County trail status is the official device by which notice of the trail closings or openings is delivered. Please call 920-232-1960 and choose Option 4 to find out the status of the snowmobile trails in Winnebago County. 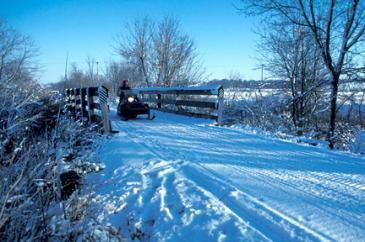 Snowmobile trails are open to all REGISTERED snowmobilers. To operate a snowmobile in the state of Wisconsin you must display current registration or carry a temporary operating receipt. Snowmobile registration is handled through the Wisconsin DNR. The maps are split into 5 "Zones". You will need the map either in hand or visible on the website when calling in for the open and closed status to see which zones will be open and which will be closed when indicated. Most gas stations and resturants along the trails carry the maps, as well as at the Parks office in Oshkosh. Please be aware the snowmobile alliance asks for a $2 donation per map to help cover the printing cost. What do the Snowmobile Clubs do? There is a 200-mile network of snowmobile trails in Winnebago County with 133.5 miles designated as state funded trails. The remaining 80 miles of trails are club trails, which mean local clubs install and maintain these trails through fundraisers and membership dues. If you snowmobile on any trail in Wisconsin, chances are the trails were made possible by the local snowmobile club. These clubs provide the trails for public use through volunteer efforts of club members. By belonging to a snowmobile club, you are helping the sport stay strong by providing good trails. You share the fun and fellowship of snowmobiling with others. Snowmobile clubs have instructors who teach the WDNR Snowmobile Safety Course. The course is required for all snowmobilers between the ages of 12 and 16 who wish to operate alone. Contact the DNR, your local club, or county association for safety class information. Snowmobile Alliance meetings are held the 4th Tuesday of each month at Rev's Bowl. Snowmobile club members work closely with landowners in the placement of trails. This cooperation results in the promotion of safe, responsible snowmobiling, which in turn benefits everyone. If you leave the marked trail, you are trespassing.